The Age last Friday released its liveability survey of Melbourne suburbs. Top five were pretty predictable: South Yarra, East Melbourne, Armadale, Hawthorn East, and Toorak. From what I can tell, it’s an update to a survey done in 2005, using the same methodology. This time however they didn’t put out the full breakdown of figures, which is a shame. But I need to point out that the survey’s transport scores are not perfect. 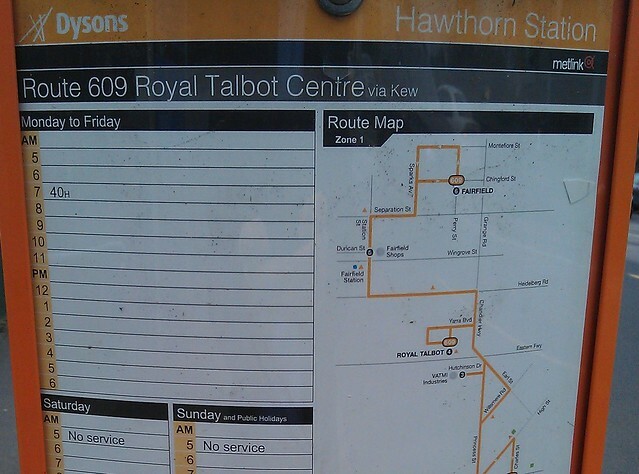 You can see this from the description of Toorak, which says that virtually no bus services helped to drag down the score. As the original 2005 articles noted: The study awards a score between 0 and 5 for proximity to train, tram and bus services — giving a total score out of 15. The problem with this type of scoring is that a suburb with lots of bus stops served by infrequent buses, but no trams, would score equally to a suburb with lots of tram stops served by frequent trams, but no buses. The 2005 figures for instance show Toorak scored 5 on trains, 4 on trams, 1 on buses = 10 for transport. Huntingdale scored 5 on trains, 0 on trams, and 5 on buses = 10. Essendon North scored 1 for trains, 4 for trams, 5 for buses = 10. But in reality these suburbs have quite different levels of usable public transport, especially for non-CBD trips. Proximity to stops does not necessarily mean usable services. 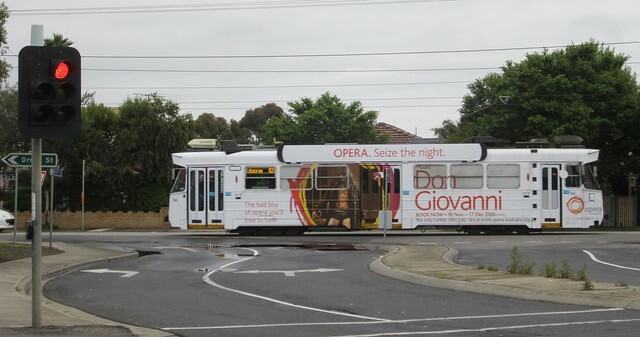 In Melbourne, most buses operate nowhere near as frequently as trams, nor do they come close in operating hours. Many bus routes operate only half-hourly on weekdays, hourly on weekends and evenings. Typical tram routes operate to 3-4 times this frequency. In some extreme cases, a bus route may only operate once a day. Did The Age’s survey give Hawthorn points for this bus stop? Infrequent buses make services virtually useless for most people, and while individuals may happen to be able to use the service because it coincides with a trip they need to make, at a time they need to make it (or they have no choice, because they can’t/don’t drive), those infrequent services can’t be thought of as enhancing the liveability of a suburb. In contrast, frequent buses (such as the services Smartbus routes offer, at least on weekdays) are useful to a lot of people, do get plenty of patronage, and do enhance mobility and liveability in a suburb. A better measure for a survey like this would be something that tried to quantify not just the proximity to stops, but also the quality of the service in terms of departures per day or week, as well as the variety of destinations served, so as to give an indication of how usable the local public transport is — and preferably in a mode-agnostic manner (though many would argue that trams and trains are more desirable than buses). Difficult to do, of course, given timetable data is not publicly available. Shame. Agreed – although its even more complicated than that. I live in Armadale, and we’re well served by PT in general, but the idea of getting a tram to work in the morning is unthinkable. I agree too. For me personally the service has to be frequent enough to just go to the stop and have a bus/tram/train show up within 10 or 15 minutes to be useful. I don’t like to have to rely on a timetable to travel and of course the service may or may not be on time anyway. Just one skipped over train/tram/bus service on an already infrequent route makes the service unuseable and untrustworthy. Fortunately I live within a short walking distance to a train station as well as several frequently serviced tram routes and I almost never have a problem getting to where I need to go in a timely manner. A high proximity to stops also often implies another fault. Meandering buses that ignore arterial roads in order to increase the coverage map as much as possible. This logic of course ignores that the services will be slow, tedious and uncomfortable instead of somewhat direct, and far quicker. Personally speaking a more meaningful choice would be to walk the 5 minutes to Jacksons Road and catch a direct service following the main north south route Jacksosns/Elonera/Chandler Roads then Railway Parade via Yarraman station to Dandenong! Its not a “fault”, to go where your users want to go, if your user market is pensioners and cripples. Anyone in a hurry would be driving. Unfortunately the bus market will remain ‘students, pensioners and desperates’ (a quote from the Oakleigh Ventura depot, not me!) operating like that!